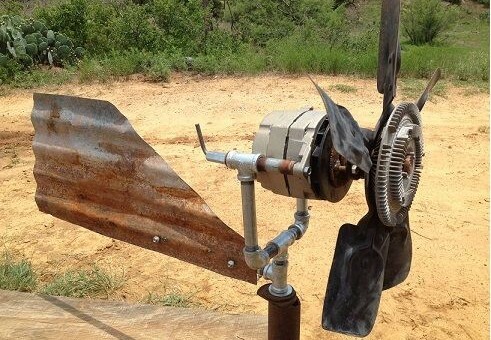 Our lackeys are constantly scouring the Interwebs for great content and today their gnarled fingers have uncovered a great DIY project that uses abundant GM-sourced parts. Ready to learn how to build a wind generator that can power (part) of your house (or maybe keep all your car batteries fully charged)? The energy is yours for the taking as long as the wind is blowing. The generator uses only four major components, most of which you can probably scratch together in a day or two. Once you’ve collected all the necessary parts– most of which can be found at a junkyard or a GM shop– take a look at the video below to get a general idea of how it all works. While this particular video doesn’t show how to fully assemble the turbine, the narrator assures us there are plenty of accompanying videos that can show you how its done. If you’re looking for a weekend project, this one’s for you. If you decide to pursue the project be sure to let us know so we can share your progress with other DIY’ers on GM Authority. Ready to go? Read the assembly instructions here and check out the video below. Next story GM Eyeing Issue With Outgoing Chevrolet Malibu Stop/Start System, Is A Recall Next?